I'll never forget the time when I was dreaming about purchasing a vintage trailer. It was almost 4yrs ago, I was walking through a dark season of depression. I was pregnant with my 3rd baby, and felt a sense of uncertainty in my identity and purpose. As a result, my depression led me to closing my photography studio for a week, and diving into deep intimacy with God through silence, exploring nature, mediation, prayer, reading, and so much more. It was during that week, where I became aware of the lies I had believed about myself, dived into His promises for me, learned what it means to be vulnerable, and so much more. I remember on the 4th day, God pressed in my heart and said, "Write the dream down. I want you to dream again," and so I did. As I wrote, I began asking all the "how's," and with a gentle conviction, He whispered, "I didn't ask you how, I asked you to dream." So I scribbled over the whole page, and started fresh. I drew a trailer with a truck hitched to it, which at the time we didn't own either. I dreamed of using the trailer as a way to further my heart for giving back through Click For Hope. I dreamed of traveling nationally to photograph and share inspiring stories. I dreamed of teaching, and sharing why as entrepreneurs we should give back. During this time, I also felt I needed to let go of my studio. Everything in me was reluctant, lets just say, I let weeks pass by. It was so hard to let it go because I dreamed of having my own photography studio for so long, and I had finally gotten one all to myself. I perceived letting it go as failure. But out of my obedience, I turned in my 30 day notice. The day I was approved, also happened to be the day where I was hosting some Click For Hope sessions. My last client for the day walked in, and shared how much they loved the space. I don't know why, but I felt inclined to share that I was moving out of it, and began to share this new vision. And as I shared, the mom looked at me wide eyed and said, "You know what?!? My parents are selling a trailer. Can I call them?!?" As she was chatting with her dad over the phone I remember telling God, "Is this really happening?" She begins to say out loud the kind of trailer they are selling, and I'm freaking out all the more. You guys, it was the exact trailer I had written down, but thought it was out of reach due to how popular and expensive they were. After some negotiation, the couple met me at my budget. They loved my story and what I wanted to do with the trailer. Now I just needed to figure out a way to pay for it. In some crazy ordained way, a friend offered to borrow me the money interest free, and said that I could pay her back over the next 6 months. This provision was so baffling to me, because at the time I barely knew her. In Feb of 2015 we found ourselves packing up the kids, and traveling to Colorado to pick up Hope, our 1961 Shasta Airflyte. It was during that time, that my husband said, "Honey, I love how much you love to giveback, but we need a way to fund it," as the light bulb goes off in his head, he continues to say," Why don't we put a photo booth inside of it." I immediately said no, but after pondering on it for several weeks, I finally said, "Let's do it!" 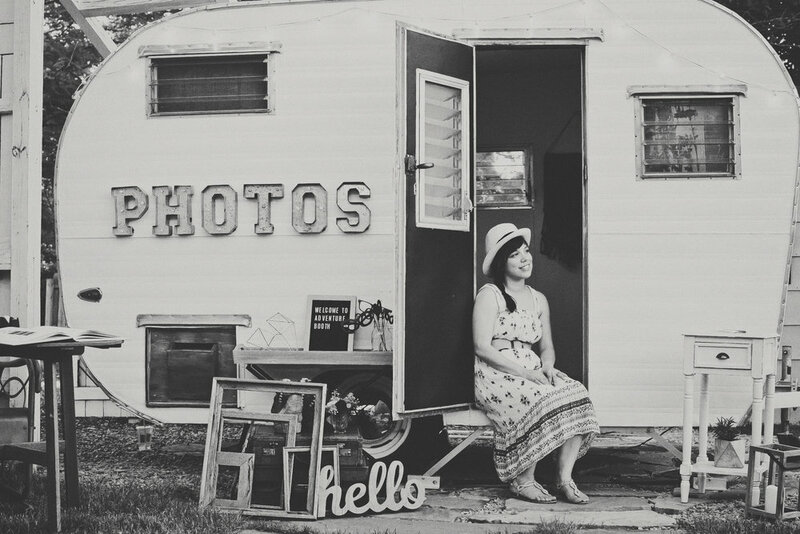 I had no idea that a year later since launching our business, we would go back to Colorado to pickup a 2nd trailer, Faye, because our vintage trailer photo booth experience would take off. It's a year later since picking up Faye, and now we find ourselves in a Firehouse, that can safely store our trailers. This firehouse, is a dream within itself, and I'll be sharing more of that later, but we see it being a space where we will be able to host events, and have community with our neighbors, friends, and clients. We long to be a light in our village. It's crazy to see it all come full circle. I now have a studio again, all to myself, well kind of....as Jeremy and I will be sharing it, but this time it's SO much bigger! Renovations should be starting soon, but until then I sense God just wants me to sit in His goodness, to marvel at all how He did it. It was all because I dreamed again, because I chose to partner with him, trust him, and let go of whatever had to be let go of, so we could enjoy what He had for us. I share this friends, because I wonder in what ways is He asking you to dream again? In what ways is He asking you to open yourself up, and let him in just enough to trust him, so you can hear His voice. He longs to share how much He deeply loves you, and in more ways than you can even fathom. Friends, I pray that you would feel His overwhelming perfect love right now as you read this. It's okay.....take a deep breath, and as you inhale, and exhale let him whisper all that He sees and dreams of for you. Alrighty friends, that's it for today!